Jessica Seinfeld, wife of the comedian Jerry Seinfeld, advocates pureeing vegetables and sneaking them into a familiar food such as macaroni and cheese. Nancy Tringali Piho, author of the book My Two-Year-Old Eats Octopus: Raising Children Who Love to Eat Everything, thinks it would be great if you could introduce your child to a wide range of exquisitely prepared foods from around the world, preferably before he's out of the high chair. You could easily spend all day and a sizeable trust fund following the most popular recommendations - and still see your young child spit a seemingly harmless food (homemade chicken nuggets, sliced cucumber) right on the plate. So what's a busy parent to do? Like many parents of the young and the picky, I'm basically concerned with increasing vegetable consumption - not with impressing the other restaurant patrons with my kid's passion for octopus. I also place a pretty high value on my own time and effort. So, with those factors in mind, I redirected my efforts: I resolved that I would continue to try new techniques for promoting vegetable consumption, but not only those that had proven effective in large studies published in respected scientific journals. That, as it turned out, left me with surprisingly few options. "The vast majority of scientific research has been through repeat exposure," says Terence M Dovey, a lecturer at the Centre for Research into Eating Disorders at Loughborough University. "You show (the food) once. You show it again. You show it again. You show it again. And at no point do you force the child to eat it. Eventually, the vast majority of children will accept the food." There's plenty that researchers don't know about picky eaters, starting with the basics, such as how many there are. Estimates vary widely, from 8 to 50 per cent of kids, with researchers differing on how to define the term. Some allow parents or caregivers to define pickiness, others look at how many foods kids actually eat, and some look at average kids during some or all of the peak pickiness years: ages two to six. "The research is a bit hampered by that," says Lucy Cooke, a senior research associate at the Health Behaviour Research Centre at University College London. "The definition of picky eating is a very wishy-washy one; it's hard to tell what people mean." Even in the case of the relatively well-tested repeat exposure, the evidence of effectiveness is "pretty good" as opposed to very good, says Dovey. Still the evidence for repeat exposure keeps piling up; a 2007 review of scientific studies by Cooke in the Journal of Human Nutrition and Dietetics found repeated exposure can increase liking and consumption. And in the past 10 years, scientists have begun to venture into the ultimate picky-eating battleground - the home - with a few large, well-structured experiments which provided promising, if occasionally contradictory, results. In a 2003 study published in the journal Appetite, a team of British researchers divided 143 kids ages two to six into three groups. The parents in one group got nutritional information, the parents in the second (control) group didn't get any extra assistance, and the parents in the third group were asked to offer their kids a taste of a single moderately disliked vegetable every day for 14 days. Parents complained about the number of tastes required, but of the 10 parents in the "14 tastes" group who did follow-up interviews, seven felt that the experiment did have a lasting effect on their child's opinion of the test vegetable. "It is his favourite, and he would not touch it before," one parent was quoted as saying. 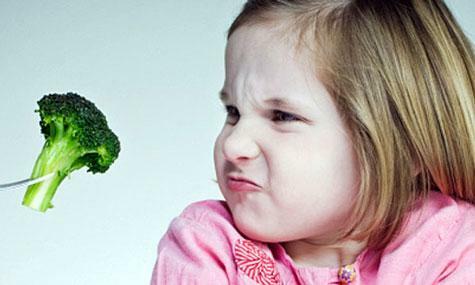 Lucy Cooke, co-author of a large 2003 study that found repeated tastings increased a child's acceptance of a vegetable. But Cooke says can't guarantee that parents will get the same results she did, but the technique does look "very promising." Here's the basic procedure: Every day for 14 days, the parent would offer the child small pieces of a single "moderately disliked" target vegetable (either carrot, celery, tomato, red pepper, green pepper or cucumber, depending on the child's tastes). The vegetable was served raw and the kid could eat as much or as little as she liked. A parent might say, "You don't have to eat it, just taste it" or "I've (tried) it, can you do it too?" At the end of the 14 days, the children were consuming more of their target vegetables, and reporting that they liked them more. Not all kids are willing to even try a disliked vegetable, Cooke acknowledges, but she says a small non-food incentive can tip the balance.